Boston Pizza Foundation - Investing in Kids, Increasing Local Visibility — Kidzsmart Concepts Inc.
Boston Pizza’s highly-successful restaurant activity books have been an invaluable vehicle for bringing visibility to the Boston Pizza Foundation and their initiative Future Prospects: Role Models for Life. Three times a year, exciting new issues of the kids’ activity books are available in restaurants. That means three times a year, fresh Future Prospects messaging and content is shared with kids and families in communities across Canada. It’s a highly impactful, direct, and kid-friendly platform for advertising one of the many ways Boston Pizza gives back to the community. The kids’ activity books have featured Future Prospects since the program’s launch. 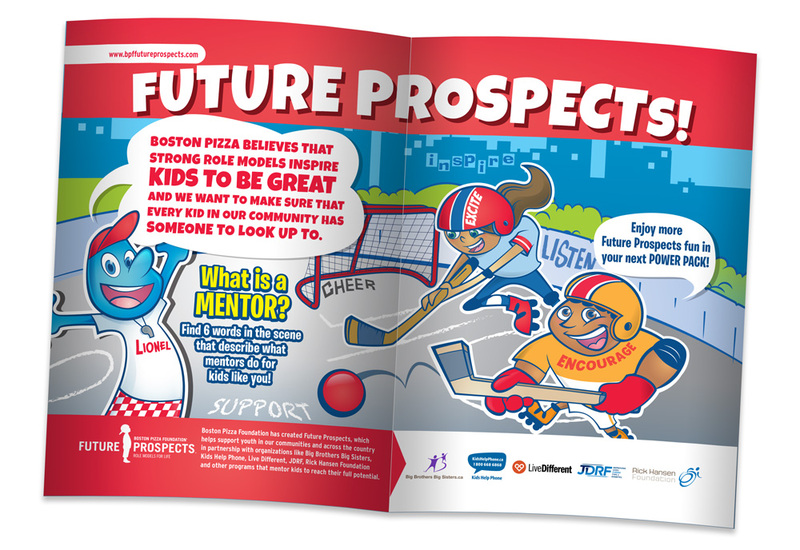 With dedicated pages in every issue, Future Prospects utilizes Boston Pizza’s own diverse team of custom kid characters and Boston Pizza’s mascot, Lionel, to promote company and Foundation values of mentorship, positivity, community and teamwork. The characters deliver Future Prospects messaging through fun, age-appropriate and family-friendly activities and games. As a platform for Boston Pizza’s community efforts, the themed activity books remind families that Boston Pizza is not only a place to “gather round”, but is also a vibrant and active part of where they live. When families visit Boston Pizza, they can rest assured that their restaurant invests in them and their community. Families love a business that gives back to their community. Need to get your community messaging up-front and centre? Contact one of our sales representatives for samples of Boston Pizza, and to find out how your community messaging can better reach your market through a custom kids’ activity.